GM loaned me an all-electric Chevrolet Bolt for a long weekend test-drive. My first reaction? It's a good looking four-door sedan. Then, I drove it. The Bolt is fast! That is not unique among among electric vehicles. I test-drove an all-electric Tesla Model S last year, and its acceleration pushed me back in my seat. But that was a $100,000 car. The Chevy Bolt is both fast and affordable. You can buy a Bolt for less than $30,000, after tax credits. But that is not why you should test-drive a Bolt. Imagine being at the 2007 Macworld Expo where Steve Jobs introduced the first iPhone. Test driving a Bolt is a similar opportunity: It's like experiencing the future -- and liking it. I have test-driven the other electric vehicles in the Bolt’s price category. Every time I punched their accelerators, the energy gauges would scream, “range anxiety!” -- warning me that punching the pedal too often would shorten my battery range. Not so with the Bolt. A fully-charged Bolt has an intoxicating 238-mile driving range. As someone so strongly identified with sustainability, I should have driven the Bolt prudently to save resources. But I just couldn’t. I drove the Bolt like a teenager having fun with dad’s sports car. It was a blast driving the Bolt on a twisty, two-lane mountain rode. A trailing two-passenger Lexus sports car struggled to keep up! And it makes sense: In addition to breaking boundaries when it comes to battery range, the Bolt is also America’s first affordable all-electric sports car. When will car manufacturers begin sizing their digital dashboard screens the sam way they boost horsepower? The Bolt answered that frustration for me. It comes with a 10-inch digital screen as standard equipment, which is as sweet as the Bolt’s high speed. This screen made looking at my mapped routes fast and comfortable. Unlike on most car screens, I didn’t have to divert my eyes to squint at map details or written directions. The companion verbal instructions, via Apple Play, were accurate and timely. I also did my first verbal text message using the Bolt’s massive screen and Apple Play. I would never have tried this on those smaller screens. With the Bolt’s screen, I had a successful experience without distracting me from driving. The car’s sound system is as enjoyable as the big digital screen. The only problem I had was letting my wife listen to my iPhone playlists. She dunned me the entire weekend of test-driving to put my music on her iPhone. One article cannot do justice to all the things I liked about the Bolt. So this will be the first of many that will review this car’s technology and compare it to a Toyota Prius, a Chevy Volt and a Tesla Model S.
But here’s the bottom line: The Bolt is comfortable, practical, clean-running, attractive and affordable. But none of that will be the reason most will consider buying a Bolt. Most will start talking to a dealer after they freely punch the accelerator knowing they have no range anxiety. Why hasn’t America discovered the Bolt? Tesla just achieved a stock valuation greater than GM’s. I can only believe this is because America has not shown up for a Bolt test-drive. If Americans would test-drive a Bolt, they would experience a vehicle as revolutionary as a Tesla. Plus, GM beat Tesla to the starting line with an all-electric car that costs less than $30,000 after tax credits. We're still waiting on mass delivery of Tesla's affordably-priced vehicle, the Model 3. Back in 2007, don’t you wish you were one of the first to get an iPhone or buy 1,000 shares of Apple stock? 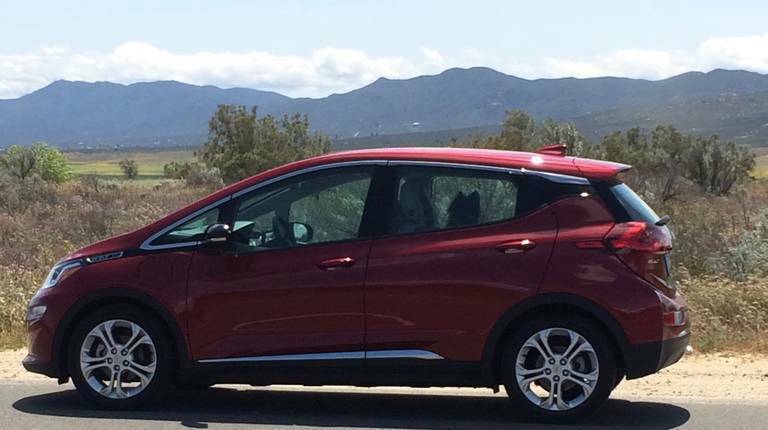 You get a second chance: Go test drive an American-made, all-electric Bolt. If you are like me, after a test-drive you will start pestering your spouse about buying one!